EghtesadOnline: A US effort to enlist Europe in its pressure campaign against Iran faced a setback after officials said ministers from several European Union member states and EU foreign policy chief, Federica Mogherini, will skip a summit organized by Washington on Iran and the Middle East in Poland. 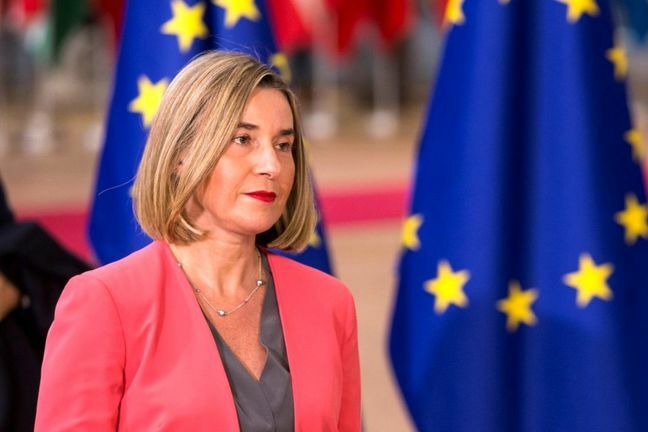 A senior EU official said on Thursday that Mogherini would not attend the Warsaw gathering because of a prior engagement, the Wall Street Journal reported. The senior EU official said the bloc remains unclear on what vision of Middle East peace and stability the Feb. 13-14 summit intends to promote. There is “a lot of uncertainty about participation of many other EU member states at a ministerial level”, Financial Tribune quoted the official as saying. European diplomats said in recent days that France is unlikely to send its foreign minister. Britain and Germany have not decided their envoys. Luxembourg’s foreign minister said he would miss the event because of a prior arrangement. One European diplomat said the bloc would not be “joining an anti-Iran coalition”. US Secretary of State Mike Pompeo announced on Jan. 11 that the United States and Poland will jointly host a ministerial meeting on the Middle East in Warsaw. He said the summit will bring together “representatives from 70 countries from Asia, Africa, the Western Hemisphere, Europe and the Middle East”. While the meeting is to address issues of peace, stability, freedom and security, a major part of the agenda, according to the top US official, is to make sure “that Iran is not a destabilizing force”. The meeting is part of the US push against Iran that includes withdrawing from the Iran nuclear agreement and reimposing sanctions that the US had lifted as part of the deal. The choice of Poland, an EU member state, to co-host the summit has been seen by some European diplomats as an effort to split the EU over Iran. The bloc is a strong supporter of the Iranian nuclear deal and is seeking to retain economic ties with Tehran despite renewed US sanctions on Iran following US President Donald Trump’s decision in May to unilaterally withdraw from the nuclear deal. A group of international activists have signed a petition calling on European countries to shun the summit, which they see as a bid to step up the US pressure campaign against Iran. The activists have launched the petition on the website of the anti-war group Code Pink to ask European states not to attend the meeting. They believe the objective of the meeting is to “set the stage for an unnecessary conflict with Iran”. More than 3,000 people have so far signed the online petition, which appeals to EU countries to stay away from Pompeo’s “belligerent conference” and “instead host a gathering on Middle East peace with all Middle Eastern nations, including Iran”. Code Pink is an internationally active NGO that describes itself as a “grassroots peace and social justice movement working to end US-funded wars and occupations, to challenge militarism globally and to redirect our resources into health care, education, green jobs and other life-affirming activities”. “The other signatories have remained in the agreement and have been looking for ways to circumvent US sanctions on Iran. It is the Trump administration’s withdrawal from the long-negotiated agreement and its increased hostility toward Iran that have added to the instability of the region and are threatening to unleash another devastating war in the Middle East,” they said. The activists maintain that since European countries are still a party to the Iran nuclear agreement and want to improve relations with Iran, it would not make sense for Europe to participate in a conference hostile to Iran. “Your non-participation would send a critical message to other countries to follow your lead,” they said. Iran has expressed its strong protest at the planned summit, with Foreign Minister Mohammed Javad Zarif denouncing it as a “desperate anti-Iran circus”. Iranian authorities on Saturday summoned Warsaw’s top diplomat in the country and called off a Polish film festival. During a Monday meeting between Polish Deputy Foreign Minister Maciej Lang and Iran’s Ambassador Masoud Edrisi Kermanshahi, the two sides agreed to continue consultations over the agenda of the Warsaw summit. “The talks covered plans to organize a conference on peace-building and security in the Middle East, to be hosted by Warsaw,” Poland’s Foreign Ministry said in a statement after the meeting. During Monday’s meeting, the Polish deputy foreign policy chief said over 70 countries representing different views and maintaining different relations with Iran have been invited to participate in the conference. “We want this event to offer an opportunity for in-depth discussions about developments in the region and to look at ways of solving its major problems,” he said. The Iranian envoy hoped that further work on the program would make it possible to include a wider range of topics that are relevant to Middle East security.